Today is Good Shepherd Sunday or alternatively known as Vocation Sunday, the day we pray for more vocations to the priesthood. Yet, the gospel reading, though it makes an allusion to a shepherd, uses an entirely different and even strange analogy. The Lord tells us in a most solemn tone, “I am the gate of the sheepfold.” The imagery from His words certainly has many layers of meaning and I believe that this is intentional. The most common explanation put forward is that the Lord is drawing from the pastoral experience of the shepherds, who would coral their sheep within a rocky sheep pen in the open. A second interpretation strikes closer to home. Today’s passage follows immediately after the healing of the man who was born blind in Chapter 9, and which we had heard on the Fourth Sunday of Lent. The context is the Temple precinct. 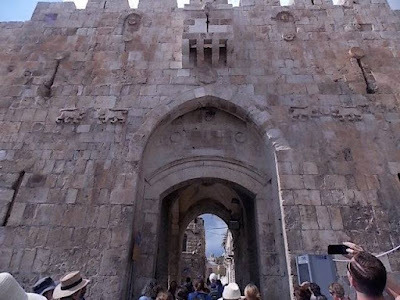 In the many gated ancient walls of Jerusalem (there were a total of 12 gates), there was a gate on the north of the city, through which animals were brought in from the surrounding areas to be sacrificed. It was called the Sheep Gate. It takes its name from the main category of non-human pedestrians passing underneath its arch – sheep. Once through the gate, the sheep were led into the Temple and offered as sacrifice, a sin offering, on the altar of repentance. One may regard this as a kind of a bloody confession. Note that for the sheep, this was a one-way trip. No sheep that passed through these gates would be led out alive. For that initial audience who had heard Jesus’ teaching about sheep, such knowledge added to the shock of His words: “I am the gate; anyone who enters through me will be safe.” And if that is not enough, the Lord will add, “I have come so that they may have life and have it to the full.” Such irony to hear these words spoken about sheep, in the very place that they were about to be slaughtered. There is also something else significant about the Sheep Gate. Located just outside the Gate were several pools of water. These pools were used to cleanse the animals before they were taken into the Temple to be sacrificed. Many of the sick, the crippled, the dying, the beggars, and the scum of society would congregate here. People around these pools were excluded and just like the sheep that passed through the Gate, they had already been written off. Since, these categories of persons seem to be a ready audience for the Lord, He would have taken this opportunity to minister in this area. Perhaps, many of you can remember the story of how the Lord healed the paralytic man beside one of these pools located by the Sheep Gate. Since the healing took place on a Sabbath, this created another controversy that would drive an additional nail into the coffin of the Lord. There were always tensions at the Sheep Gate when the Lord was around - He couldn't help challenging the people who controlled the way things worked. So the Sheep Gate of Jerusalem came to represent the victimisation of people and animals in a society which functioned with sacrifice at its centre. And so, by modelling Himself as the gate for the sheep, Jesus came to challenge and overturn the need for sacrifice - and in its place to offer salvation, and the freedom for victims to come and go “and find pasture”, and live abundant lives. The only thing that needed to be sacrificed was Himself. He is the Lamb of God who takes away the sins of the world, and the gospel which He brings would sound like this, “I tell you most solemnly, it is not the sheep that must die but the Shepherd!” So, for the sheep of Jesus’ parable, the Sheep Gate was no longer a one-way passage to slaughter, nor a place of no return. Jesus, the open gate, the generous gate, the loving gate; and gushing out of this very gate would be the source of life, abundant life, life to the fullest. Perhaps, many of us find ourselves at the old Sheep Gate. We may experience life as nothing more than the time spent between birth and death: the drudgery of existence, the boring monotony of routine, or the hopelessness of believing that there is nothing more than this life. It’s not as if people don’t try to find a way out of this predicament. Many of us, just like that crippled man who waited by the miraculous Pool of the Sheep Gate, are expecting a break in life or we find ourselves crawling to something or someone who promises the ultimate solution. But, as much as people try to make more out of their miserable lives, they are always confronted with counterfeits. You will not find life, in pleasure. Many people have tried taking back-to-back cruises or tried to retire in luxury or even live out one of their fantasies and yet they still remain empty. Try as they may in the pursuit of pleasure, eventually the law of diminishing returns takes hold. It takes a bigger thrill, or an even bigger event to bring on another high. But it never lasts! You won’t find the life too, in performance. Eventually workaholics learn that the satisfaction of one job completed is short lived. A Wimbledon tennis champion made this poignant point, “The thrill of victory lasts about fifteen minutes.” The truth is that life is not found in pleasure, performance, possessions, positions or pursuits. It can only be found in one place, or rather, one person, Our Lord Jesus Christ. Only He can truly say, “I have come so that they may have life and have it to the full.” Life is entered by no other than Christ Himself. When the Lord said He is the door of the sheepfold, He meant that the fold has only one entrance; life has one source; heaven can be entered through one entrance; and the single means of access to all that is life, is Jesus. Life is full of choices and doors. Choosing the right doors in life is important. Unlike the game shows, we don’t have to guess and hope we picked the right door. We don’t have to wonder which way to go, or what to do. Jesus says, “listen for My voice”, “look for My leading”. To the weak, to the timid, to the fearful, to the guilty, to those who are worn out and tired, He calls us all... “Come to Me you who are weary and I will give you rest," and to all of us sinners He says, "My grace is sufficient for you.” To those who have been abused or abandoned, He says you are wanted and safe with me. “I will never leave you or forsake you.” If you have been confused or have lost your way, if you have wandered and knocked on doors with empty promises, “come, come to Me and I will give you abundant life”. To the faithful who have persevered, to all who will come, from the side streets, from the highways, down the mountainsides, across the rivers and through the meadows, “come to Me, for I Am the Gate!” And all who enter through Me will find peace that only I can give, the joy of true acceptance, the comfort of assurance and the salvation for your soul!